NAB is scaling up a next best conversation capability to 3500 business bankers that could up to five talking points or offers to make when a customer attends a physical branch, calls or goes online. Next best conversation takes what an organisation knows about its customers - such as via their activity or the products they use - and uses analytics to suggest ways to engage them. It is commonly found in the likes of banks; CBA last year said its system, in the works since 2015, suggests 20 million conversation starters a day. The technology core behind NAB’s next best conversation also stretches back to 2015, when the bank implemented a suite of Adobe products including Campaign. The Adobe suite was implemented as part of a multi-year transformation of NAB’s marketing communications and customer experience function. “Our journey from a marketing perspective is really about how do we ensure that we deliver our customers the type of communication experience that they expect,” NAB’s head of communications transformation Lisa Marchant told the Adobe Summit 2019 in Las Vegas last month. Traditionally, customers had been coming into the bank’s 900 physical locations or seeking answers from bankers in its call centres. Marchant said that communications and lead-generation processes for the branches were already in good shape. “To give you a bit of a flavor around where we were at around five years ago, we were doing some incredible marketing, in particular into our physical environment,” she said. “We were sending suites of targeted leads to our bankers, and we were doing that very well. We were using our data well to actually design those leads. “But where we felt there was a real opportunity was actually around how do we actually take that banker environment that we've built and expand those principles into a digital space. Next best conversation is one of two key use cases for the Adobe stack within NAB’s communications transformation. (The second use case presents personalised messages for customers inside NAB’s mobile app; the bank previously disclosed this in-depth in September last year). Marchant said next best conversation was not a common use for Adobe Campaign. “This isn't necessarily a traditional use of Adobe Campaign,” she said. “But in times when projects are limited with resources and funding, this is a really good example of where we actually used what we had to deliver a proof of concept, which we then have later used to seek further investment. NAB’s small business banking team, which comprises about 40 bankers in a call centre, signed on to pilot next best conversation for the entire bank. 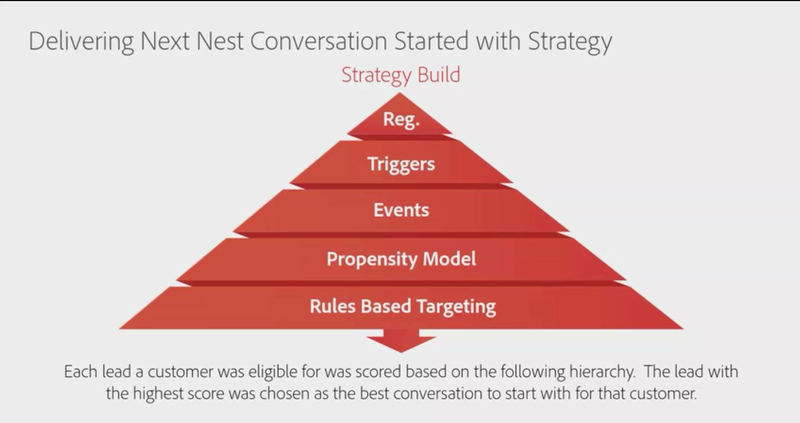 Through that initial pilot, Marchant’s team created a pyramid-like framework that effectively assigned a ranking to the types of conversations a banker might need or want to have with a customer. “This is just the framework that we used,” she said. “I don't necessarily know if it's the framework that we will choose to use in the future but this is what's working for us now. “It's effectively just a hierarchy to say ‘this is the rank order in which we should talk to customers about various things’. “In the first instance, there are certain conversations that we need to have our customers that are regulatory so it's absolutely critical that those conversations take place first," Marchant continued. “The second [tier] is there are things that customers do that we should be talking to them about, so if a customer drops out of an application form, for example, that's a customer event that we need to actually react to. The tiers after that are more predictive. One uses propensity modelling to determine the likelihood that a customer’s business is experiencing a particular phase of growth or expansion and therefore might be receptive to financial products. The final tier uses “rules-based targeting” to identify, “for example, [if a] customer is direct-debiting to another financial institution”. “We effectively laid out this framework and sought endorsement from the business that this was something that they would buy into and be comfortable with us implementing,” Marchant said. In converting that framework into a workable next best conversation platform, Marchant’s team also paid attention to how leads and conversation starters were presented to call centre staff. Marchant’s team found call centre agents were often presented with vague pop-ups when making outbound calls and were expected to have a conversation based on that information alone. “We really thought about the experience that the bankers had,” she said. “What used to happen is the dialer would run and a screen would pop up [asking the banker] to have a conversation with a customer about split banking. They knew absolutely nothing else, so we were making their job more difficult than it needed to be. 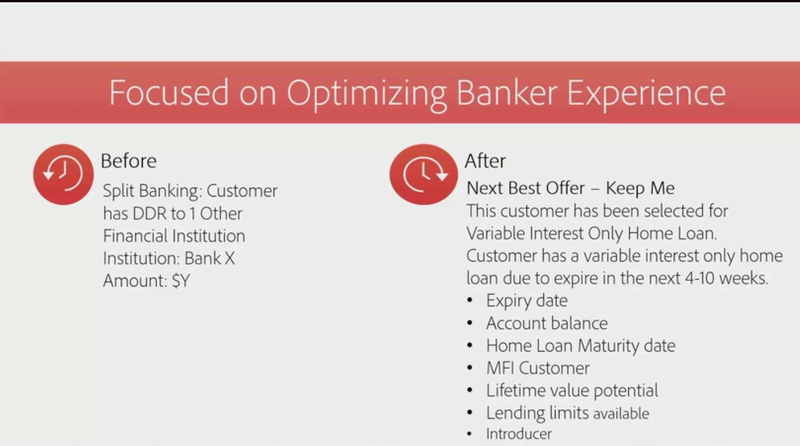 Marchant’s team worked with the small business bankers to redesign the way leads were presented to them, including much more context than before. “We restructured naming conventions around our lead so they were very clear to the banker as to what they were all about,” she said. “This was about really ensuring that we actually retain this customer, because they've actually got a variable interest-only home line due and it's about to expire. “What we also did was provide additional insights and details so one of our call centre agents didn't have to jump through several screens to find things. Bankers are now presented with a screen to start their day that shows “the top five calls that they can actually make today that will deliver an outcome”. Marchant said the next best conversation pilot had been “a great success”. “We delivered a 100 percent uplift in the opportunities that were delivered off the back of our leads and we also delivered a 100 percent uplift in revenue,” she said. The scaling up of next best conversation is currently underway. “We're currently in the process of going from 40 small business bankers to 3500 business bankers having this next best conversation capability,” Marchant said. For NAB, next best conversation means always having conversation starters ready, no matter how a customer comes into contact with the bank. “If you think about those 900 environments where our bankers are and our call centers, there's certainly a huge opportunity there for us to be having as many integrated conversations with our customers,” Marchant said. “If a customer walks into a branch, there will be a next best conversation available in the screen for that customer, so a banker is able to proactively call and also react to a customer coming in. NAB is now looking to transition the Adobe environment to run in the cloud, part of a much broader move within the bank to embrace cloud-based hosting. “NAB as a business - so not just within marketing - is moving its data and analytics environment to cloud, and we are moving Adobe Campaign as an application into the cloud,” Marchant said. “We know that the combined effect of having our data environment, our analytics environment, and our marketing technology environment in the cloud is going to be incredibly powerful for us,” Marchant said. “We're really excited about where that's going to take us."